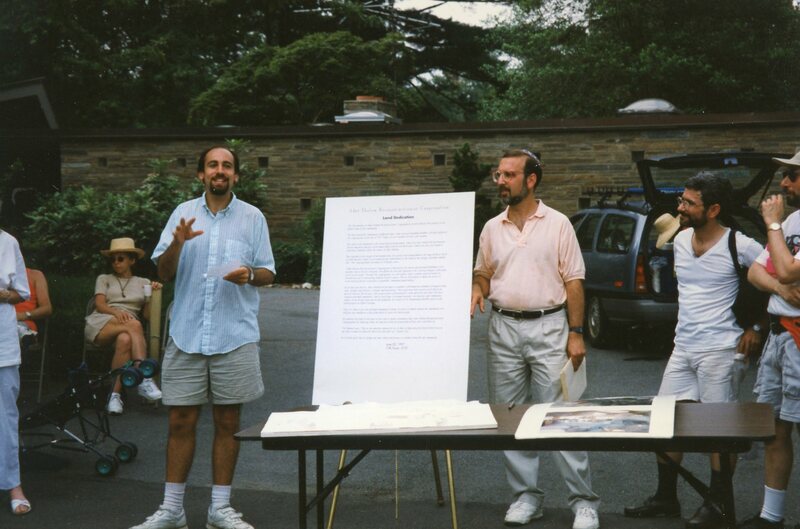 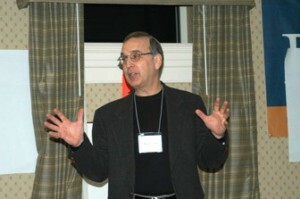 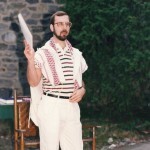 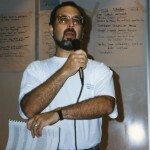 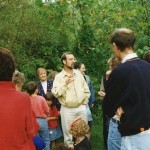 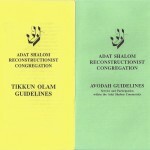 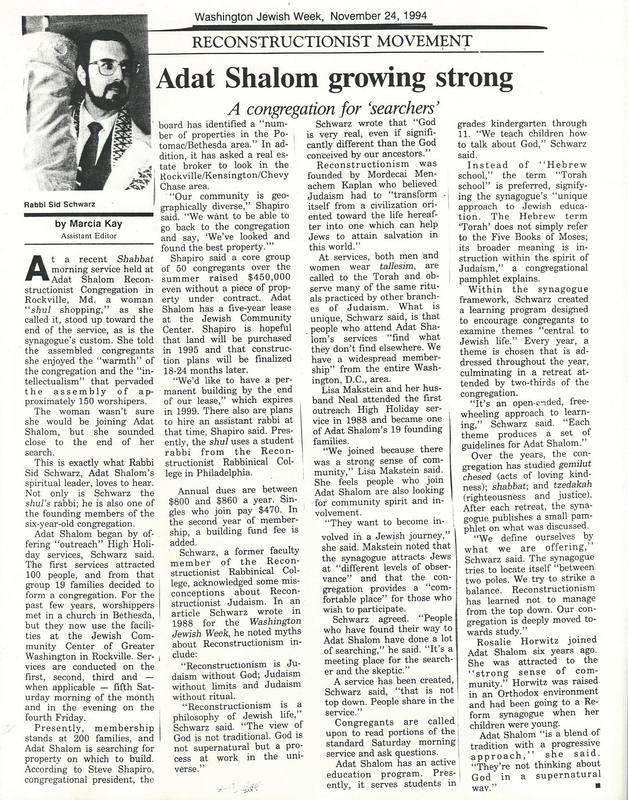 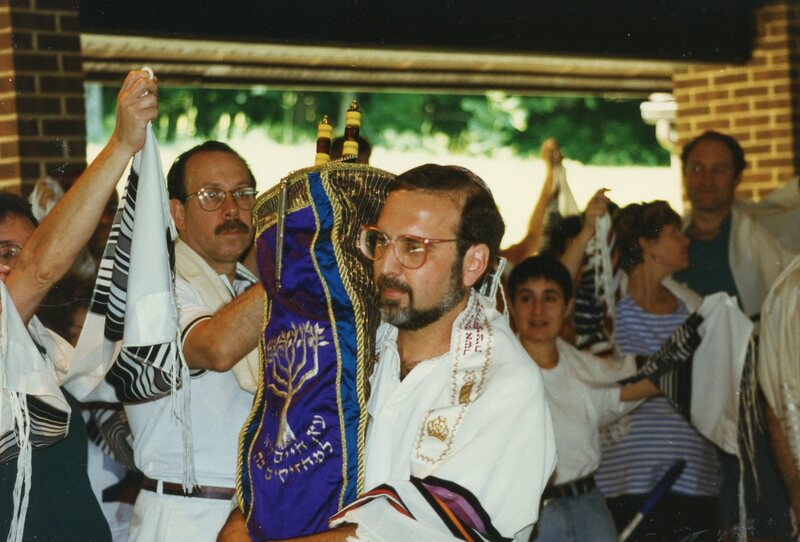 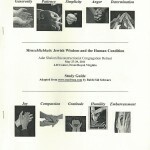 Adat Shalom’s genesis took place when the Jewish Reconstructionist Federation agreed to support an outreach High Holy Day service led by Rabbi Sid Schwarz in the fall of 1987. 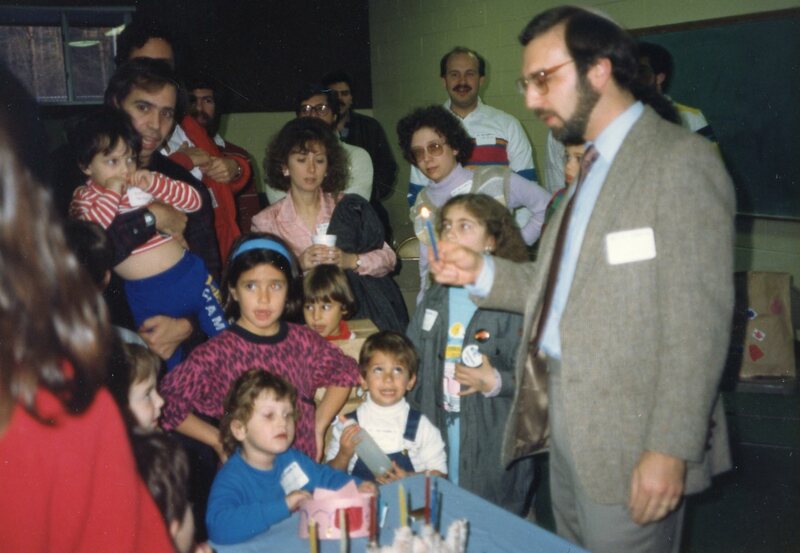 About 110 people attended the services, which were held in a small auditorium in the Jewish Community Services Building on Hunters Lane in Rockville. 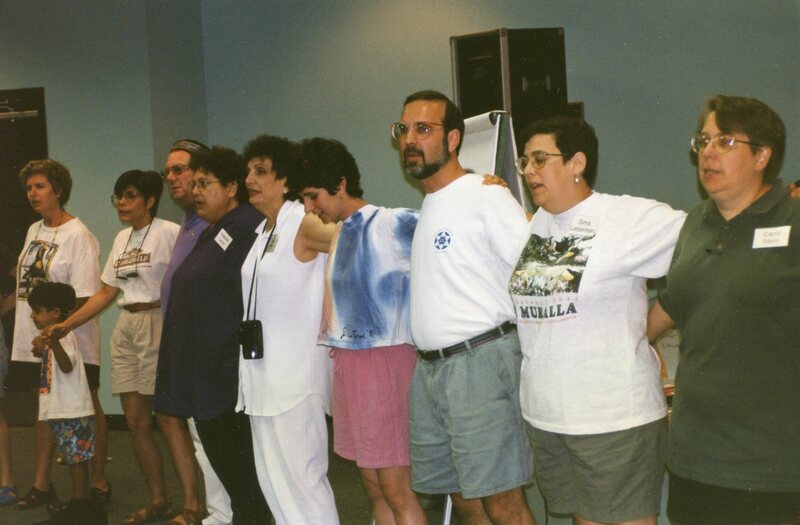 Besides a handful of long-active Reconstructionists in the area, most participants were new, unaffiliated, and willing to try something a bit different. 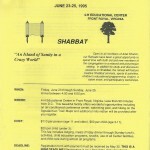 Interest in continuing to meet beyond Yom Kippur was established at a break-the-fast at Sid and Sandy’s house. 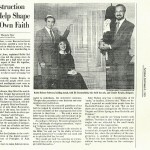 Over 40 people came to the first organizational meeting in November, 1987 to discuss next steps. 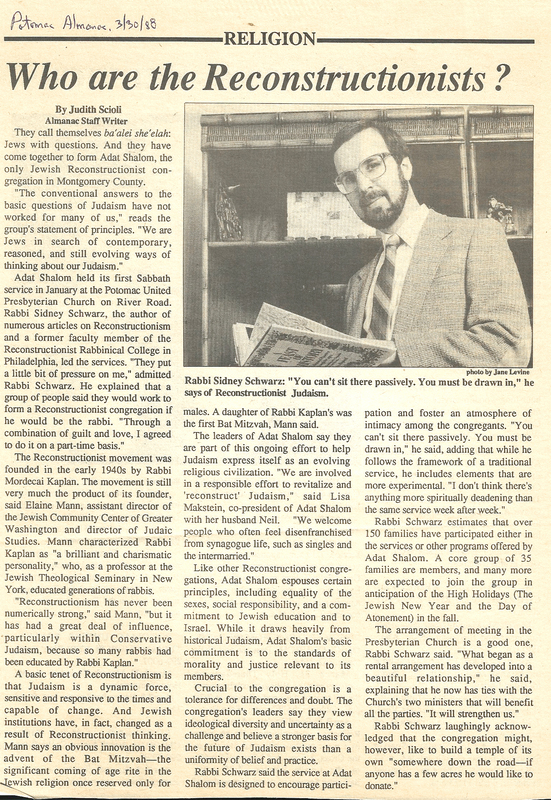 Rather than create a monthly lay-led study group or informal havurah, the group was excited by the bolder approach to actually create a new synagogue and Sid Schwarz agreed to serve the community on a part-time basis as the rabbi. 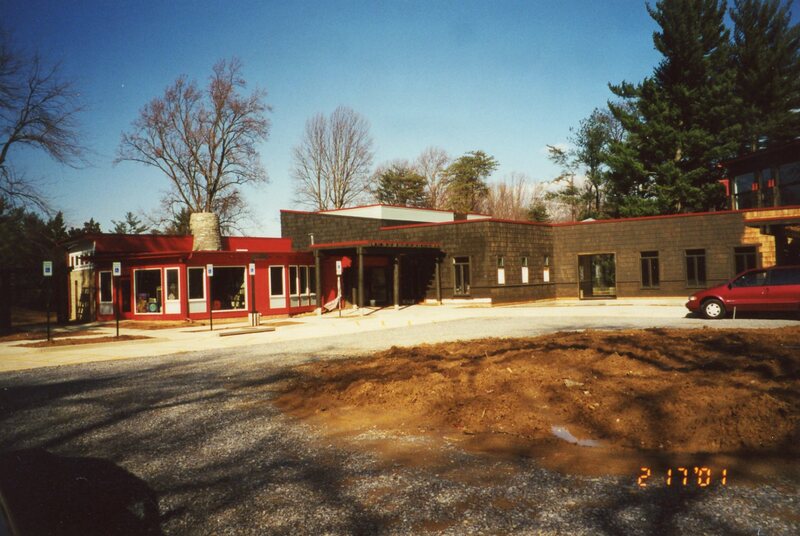 Regular services began in January, 1988 in the beautiful Potomac Presbyterian Church on River Road. 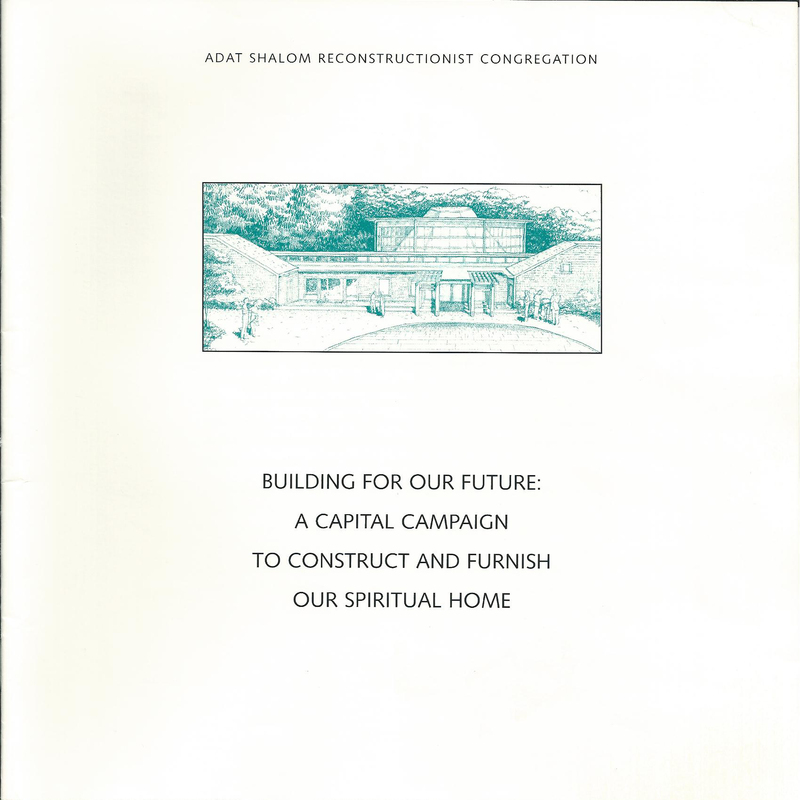 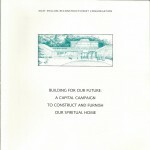 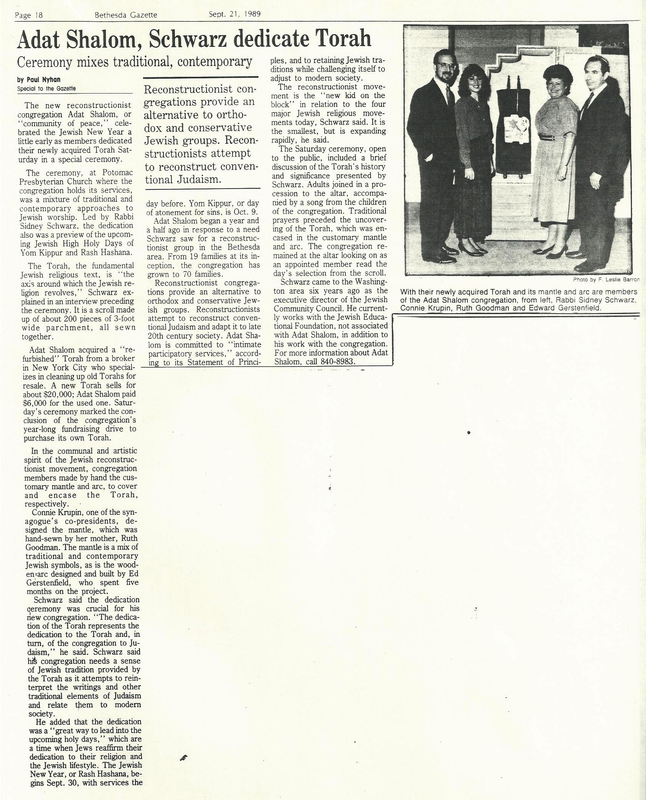 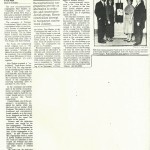 In 1993 the congregation voted to purchase land and build a home. 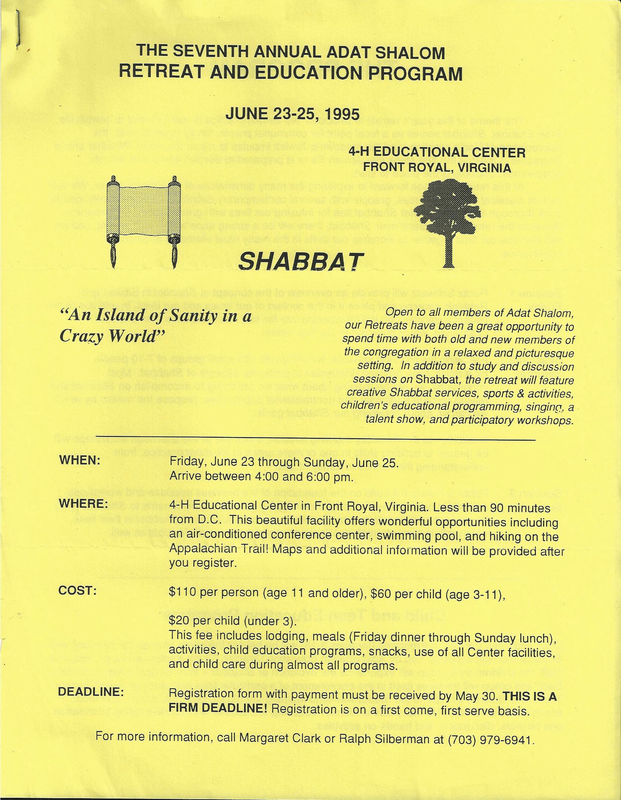 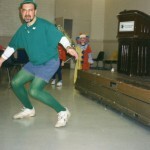 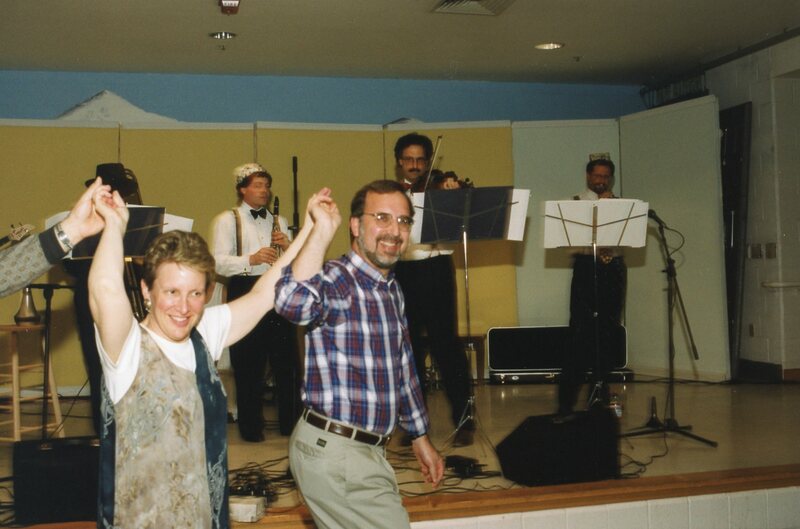 By 1995, Adat Shalom began to enjoy its first “Jewish” space at the Jewish Community Center in Rockville with an agreement to stay no longer than five years. 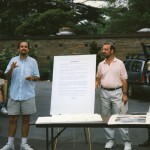 Soon thereafter a 4.7-acre track with a house on it was purchased in the Carderock Springs neighborhood at the western edge of Bethesda. 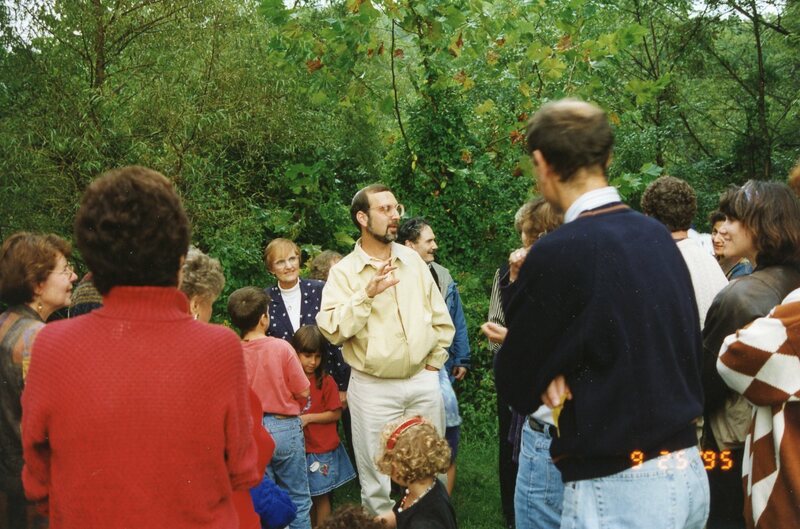 A $3 million capital campaign, with over 85 percent of the community participating, allowed us to break ground on the second day of Sukkot, 1999. 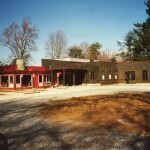 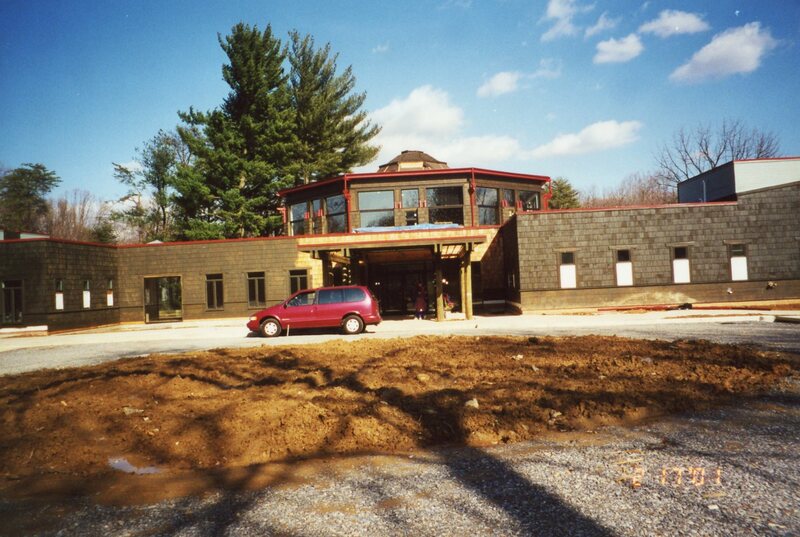 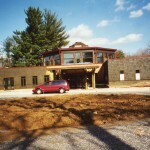 The new building was dedicated on Shabbat Vayikra, April 1, 2001. 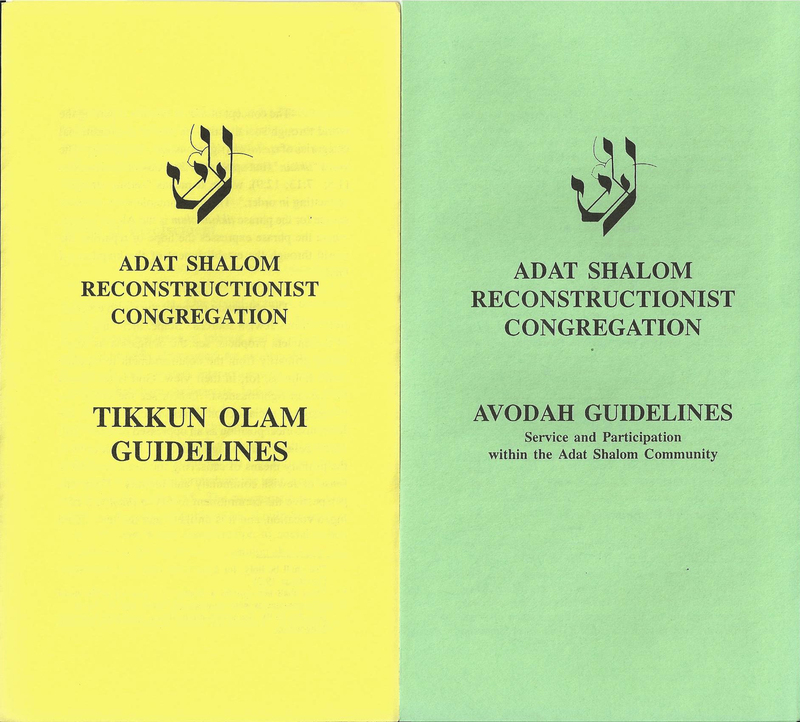 Diversity and inclusivity have long been hallmarks of Adat Shalom. 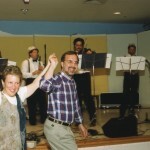 The community has been welcoming to singles, empty-nesters and interfaith households as well as those who are gay, lesbian, divorced and childless. 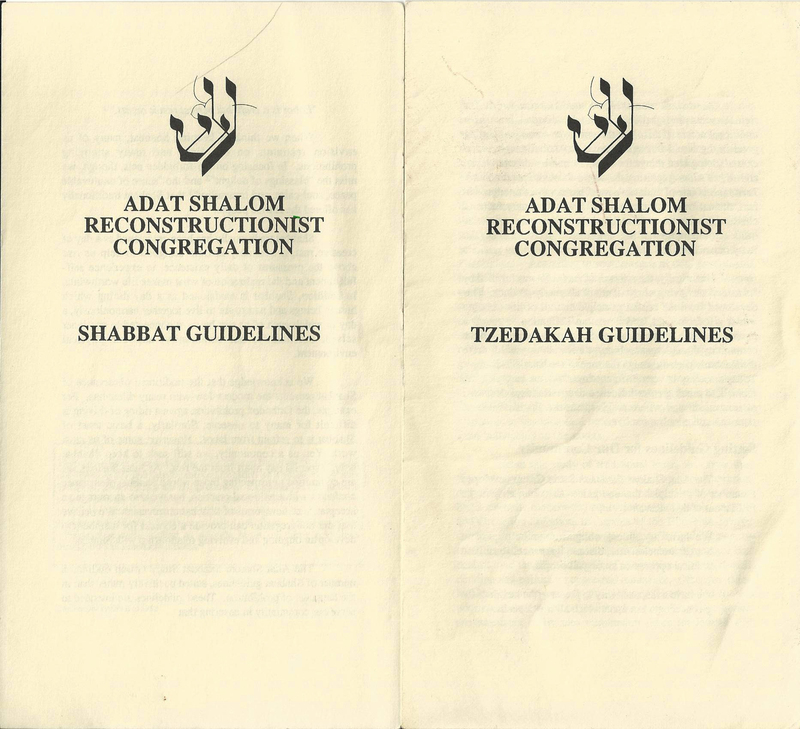 The diversity of the congregation not only cuts across class lines but also includes a wide geographic spread. 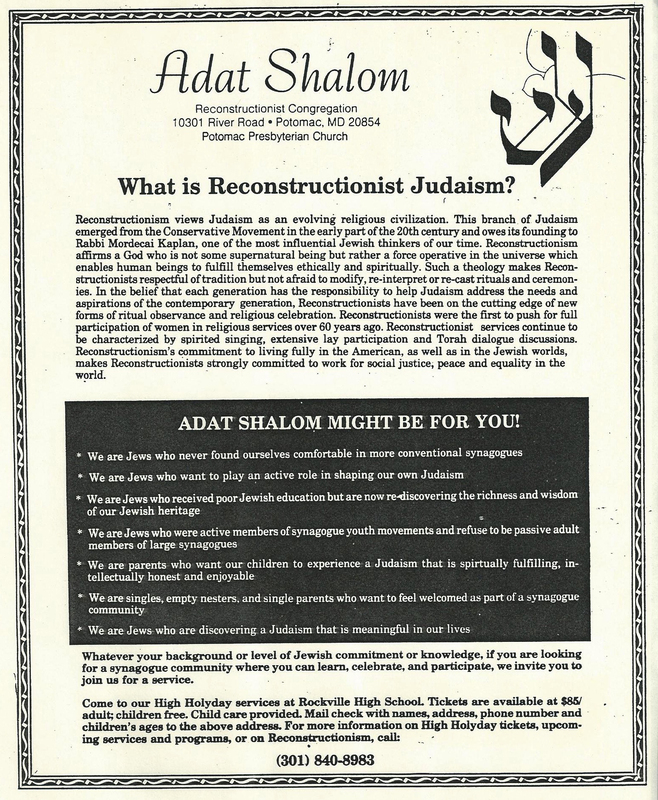 We remain a “destination” rather than a “neighborhood” shul. 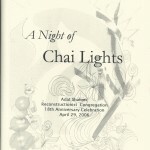 Adat Shalom has turned this diversity into a strength. 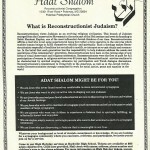 Community was built as members volunteered to train other members in synagogue skills or teach classes. 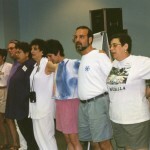 In the process, more members became able to lead parts of the service, and the ethos of participation was strengthened. 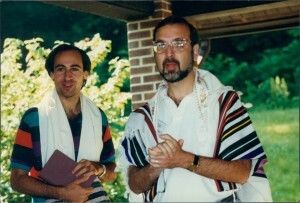 D’var Torah discussions took the place of sermons so that many voices could be heard during our services. 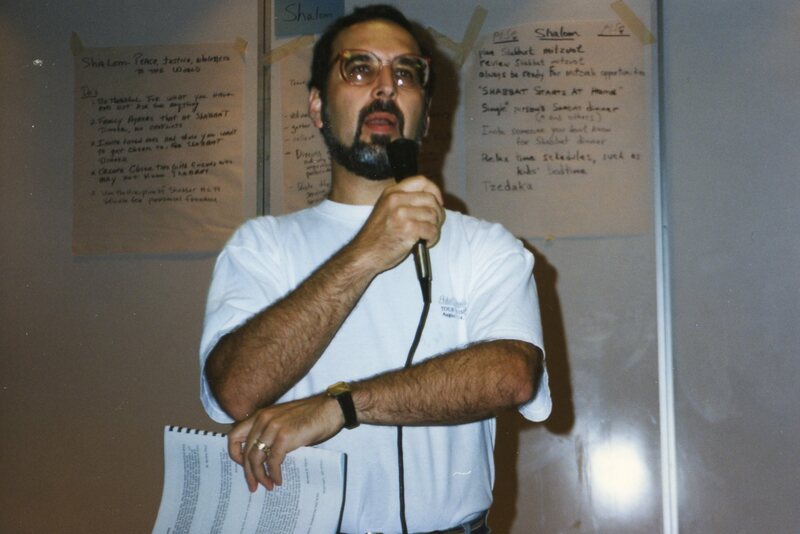 Members, as teachers and mentors, have always helped teach our youth. 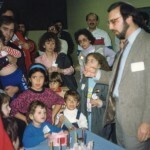 A culture of learning, action, and participation was created. 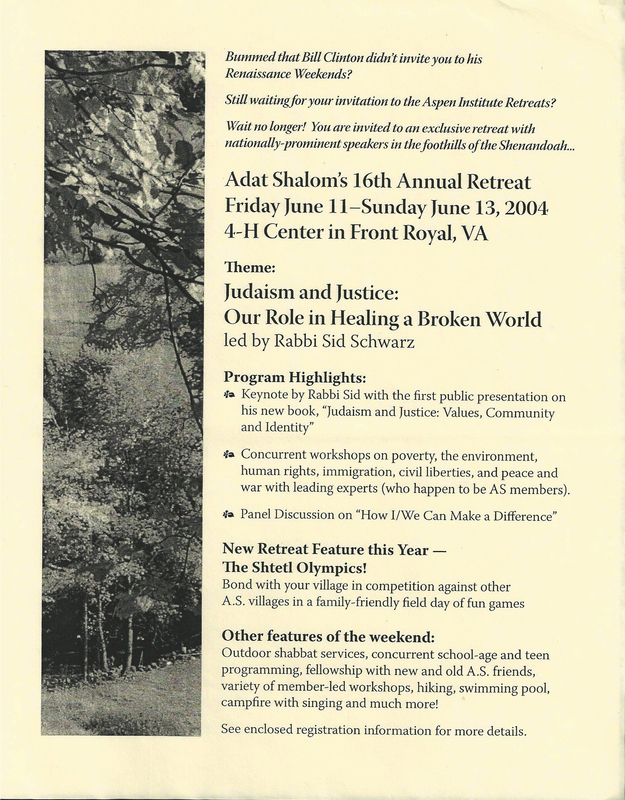 Adat Shalom became a place to lovingly wrestle with every aspect of the Jewish tradition, to explore one’s spiritual journey, and to discover the warmth of community. 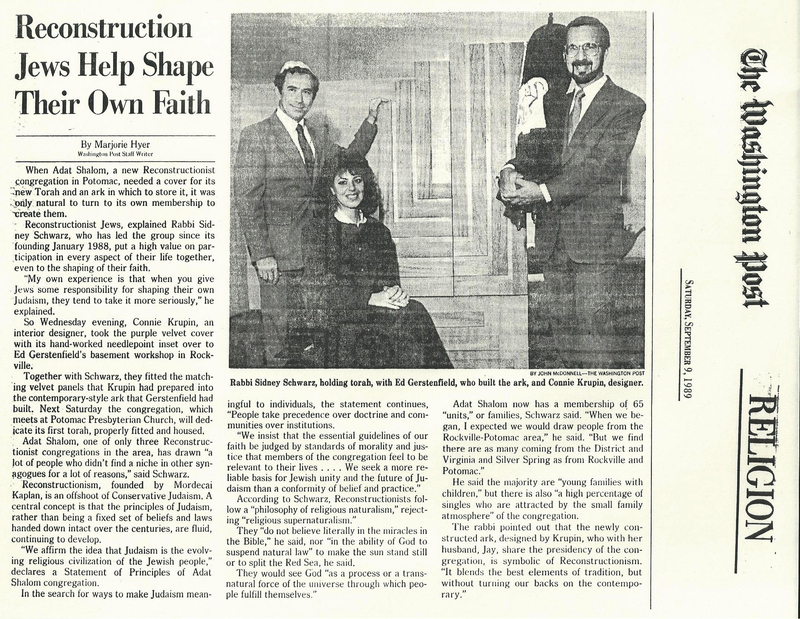 Adat Shalom achieved national prominence when Sid published his groundbreaking book, Finding a Spiritual Home: How a New Generation of Jews Can Transform the American Synagogue. 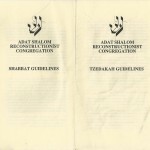 The book argues that American synagogues need to evolve from the post-war, synagogue-center model, to a new paradigm called the synagogue-community. 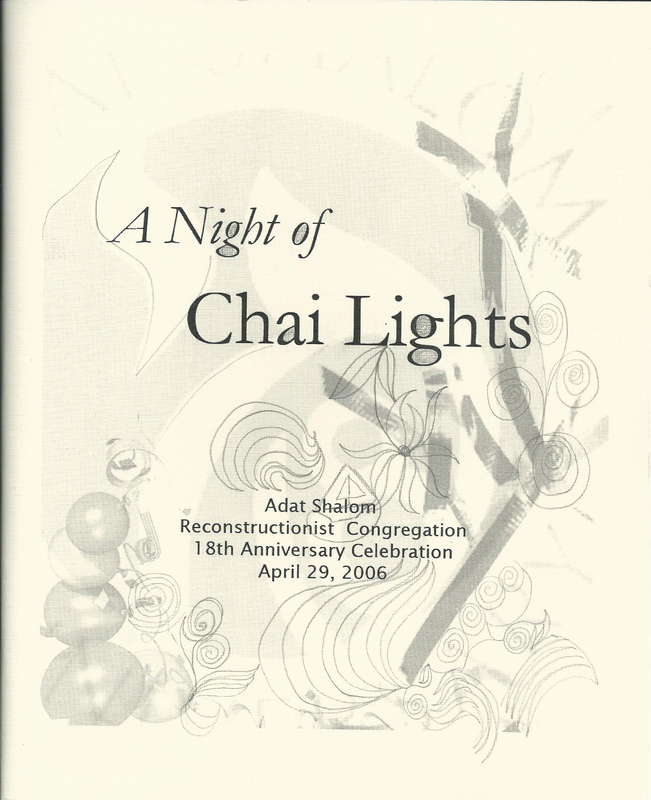 Sid based the new paradigm on what was created at Adat Shalom, an innovative model featuring high levels of participation, inclusivity and engagement – a model which is now being widely emulated around the country. 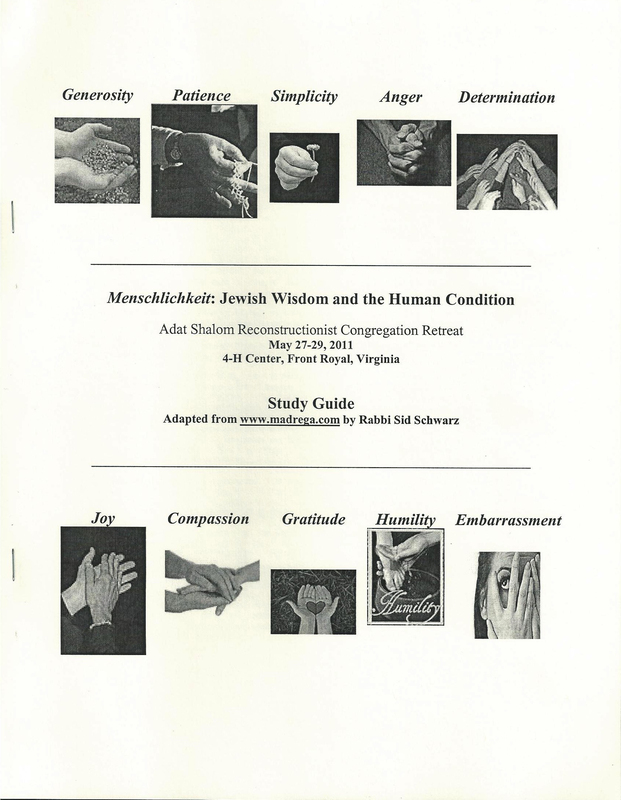 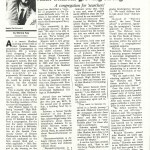 In 1996 Sid decided to devote his full time energies to PANIM: The Institute for Jewish Leadership and Values, which he also founded. 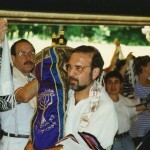 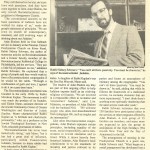 Student rabbi Fred Scherlinder Dobb was elected as Adat Shalom’s rabbi, a position he still holds. 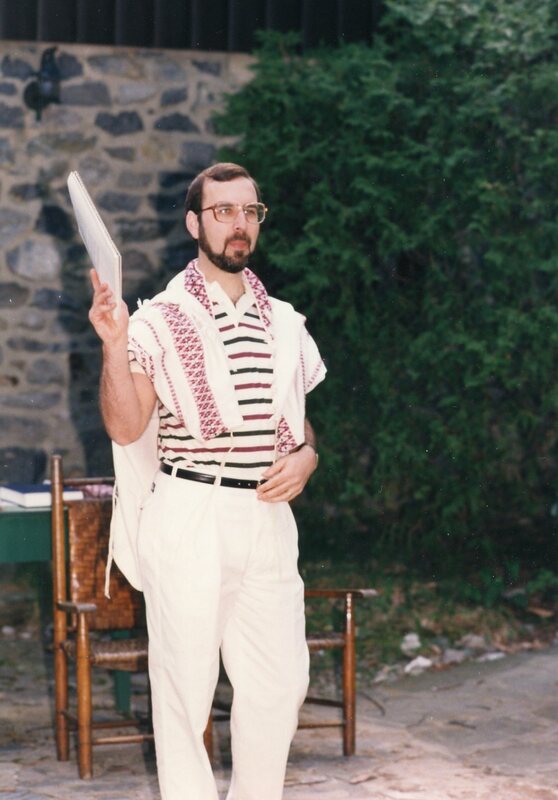 As the community’s founding rabbi, Sid continues to periodically lead services, teach and deliver a High Holyday sermon, often a highlight of the year. 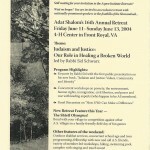 You can find more information about the Adat Shalom on their website.